Even though the international reputation of Leoš Janáček was first and foremost built round his operas, it would be regrettable to neglect his choral and instrumental works in which the Moravian composer gave us some of the most beautiful pages of his art. With his slavic soul - of that there is no doubt - he charms with his unique stylistic originality, nurtured on popular culture and folklore. Under the sure, inspired conducting of Reinbert de Leeuw, the Collegium Vocale Gent and Het Collectief ensemble combine choral works and purely instrumental music: From Potulný šílenec (The Wandering Madman) to the Piano Sonata ‘1.X.1905’, arranged by the Dutch conductor for thirteen instruments, by way of the famous Říkadla or Elegie na smrt dcery Olgy (Elegy on the Death of my Daughter Olga). Reinbert de Leeuw transmits naturally his love of the composer and inspires his musicians with an infectious poetic energy. Leoš Janáček may be best known to international audiences for his operas, orchestral, chamber and piano works, and the Glagolitic Mass, but choral music – both accompanied and a cappella – formed a central part of his oeuvre throughout his career. This was partly a consequence of his interest in folk texts, but also of the strong Czech choral tradition. So it's always good to welcome new recordings of his wider choral output, particularly when they are of the quality of this latest release on the Alpha label. There's a strong tradition of Janáček performance in the Low Countries, and Reinbert de Leeuw – who here conducts the Collegium Vocale Gent and Het Collectief – has previously recorded several of these works for Philips with the Netherlands Chamber Choir and his own Schönberg Ensemble (1993). His new recording provides plentiful evidence of long experience with and affection for this music. Speeds are mostly just a tad slower than they were in the nineties, relishing Janáček's extraordinary sonorities, but there is never any lack of dynamism. 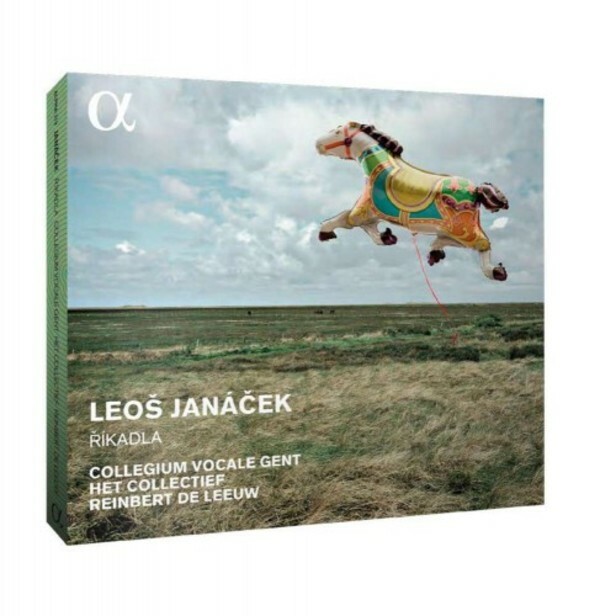 Indeed, de Leeuw's new account of Říkadla – the elderly Janáček's delightfully individual take on traditional Czech nursery rhymes – is one of the sprightliest and most accomplished in the catalogue. Long gone are the days of musically ponderous Czech performances, and thanks to the involvement of two Czech language coaches all the singing is thoroughly idiomatic. The eccentric instrumentation in Říkadla (including pairs of flutes, clarinets and bassoons as well as ocarina and child's drum) has rarely sounded so convincing or assured, proving the scoring to be every bit as telling and well-judged as in, say, The Cunning Little Vixen. Fleeting as each of the 'movements' is, they often contain a variety of changes of tempo and mood, and the response of de Leeuw and his forces is constantly alert and quick-witted. The other choral items range from the beautifully haunting, folk-texted Wild Duck (1885) to the vocally virtuosic Wandering Madman (1922). Highlights include the intense Elegy on the death of my daughter Olga (1903) for tenor, mixed voices and piano, and the dramas-in-miniature Halfar the Schoolmaster (1906) and The Wolf's Trail (1916). De Leeuw compliments the choral music with two instrumental works. The Concertino for piano and small ensemble (1925) has nature associations similar to those in the Vixen, the instruments taking on anthropomorphic associations with a variety of small animals, and this performance is not only supremely accomplished but also hugely characterful, not least the horn and clarinet playing (Anthony Devriendt and Julien Hervé respectively). The big surprise here is Janáček's incomplete piano sonata, 1.X.1905. It was inspired by the death of a Czech apprentice in an anti-German counter-demonstration when Janáček's adopted home town of Brno was still under the Austrian heel. One of the most searingly emotional of all his works, it was destroyed by Janáček but the first two movements survive in a copy made by the original pianist. It is performed here not on piano, but in an ensemble arrangement by Reinbert de Leeuw himself. He argues (persuasively) that the original contains problematic textures which are best resolved by arrangement, and his version is more a labour of love rather than an attempt at instrumentation à la Janáček. Nevertheless, there are plenty of individual touches, not least the inclusion of an accordion in the line-up, and at the moments when it really counts de Leeuw's version magnifies the intensity of the original in powerful fashion. Recorded in demonstration-quality sound, this is essential listening for lovers of Czech music, and for anyone not yet familiar with the riches of Janáček's wider choral output.